After being a coach at CrossFit South Brooklyn in NYC for 6 years I moved halfway across the country to open my own affiliate, CrossFit Lumos, in Austin, TX. This series will chronicle my experience opening the gym and what I am learning along the way. This article is the final piece of the adventure, before I’m a real live gym owner. Part 1. Part 2. Part 3. Part 4. Part 5. Part 6. Part 7. Part 8. Part 9. Part 10. Part 11. Part 12. Part 13. Part 14. CrossFit Lumos had been open for a little over a year, and some things were going very well. We had a great core community- motivated, caring, fun people who were in it for the right reasons, supported each other, and valued the service we were providing. I’d been lucky to hire three amazing coaches who all really enjoyed each other, covered for each other, and communicated well. People were having fun, the space was working out well, we had plans and ideas for how to progress and grow the gym… there just weren’t enough people there. While membership had grown steadily, it was a bit of a slow drip, a few people one month, a few the next. We were doing a good job of getting people to stay committed but some months we’d have a few people leave at once and have to fight to keep from breaking even with new and departing members. Part of it was due to circumstance- being new, being in an up-and-coming neighborhood, having moved to town vs having a pre-built client base and exposure. Still, it seemed like things should be moving faster. Flash forward to a few months later and we are booming. We are seeing lots of interest, getting those people to come in and try us out, and are converting those people to members. We’ve grown 15-20% each month over the last two months. Classes are busy to the point that we are having to buy more equipment and think about adding extra hours. Life is good! So what happened? We fixed the cracks. I went back and audited the experience of someone who wanted to join the gym, from the first Google search to signing up for membership. I found all of the places where it was easy for someone’s interest to wane and made things as easy as possible for people. Here are some of the areas we improved on and that you should check periodically if you’re starting your own affiliate. Our webpage had gotten hacked a few months after we opened, and was just a mess after that. It was buggy and slow and weird. Finally, I bit the bullet and had it totally redesigned. Beyond that, I paid for a FixRunner.com subscription- they do fairly cheap a la carte or subscription web tech support, and it has really helped. They sped up my page, check periodically to make sure everything is working properly, and if I ever want to change something and can’t figure out how I just shoot them a ticket and they handle it. My Head Coach Steve had a great idea last year, to switch from a group Foundations system to 1-on-1 private Foundations, which made scheduling much easier. I realized we could do the same thing for our Free Intro Classes, which were held once or twice a week at specific times. We changed the Intro to being a Consult/Intro that people could schedule whenever they wanted, and it has been GOLD. It makes it way easier for people to express interest and then be in the gym, talking to a coach about their goals and trying CrossFit within a few days. I’ve never been a salesman. After college I briefly sold wine for a local distributor and was horrendous at it. (The upside was that my roommate and I drank a lot of really good wine out of red Solo cups while playing Madden.) I’ve always felt uncomfortable pushing people to buy stuff and part of what I’ve always loved about CrossFit is that it’s never been about glitzy marketing or crazy promises or deals. Still, I had a lot of room to improve. I read and researched a lot, and some common themes emerged. Some I dismissed, some I tried out and couldn’t get them to work, and some have become indispensable parts of how I operate. The biggest thing I learned is that sometimes I just need to shut my stupid mouth and listen. As a coach you get very used to the sound of your own voice. Some of us grow to like it, a lot. We are accustomed to telling members what to do, and why. 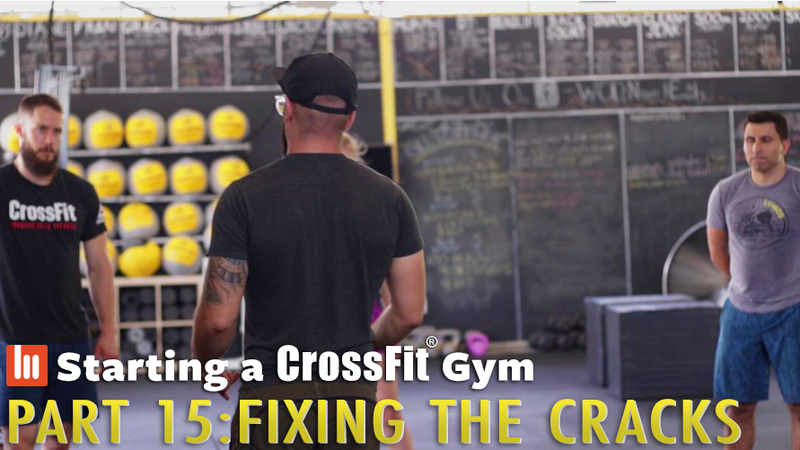 Every CrossFitter has explained to their friends, family, and coworkers why they do what they do. That’s all well and good, but what I learned is that when someone wants to take the plunge and join your gym, what they really want is to know that someone is listening and cares and wants to help them. They could care less about the difference between an AMRAP and an EMOM (for now). Stu from WTF Gym Talk (worth a follow) mentions this a lot, and it’s turned into a challenge/game I play with myself. When someone walks in or takes an Intro, I try and spend the first 10-20 minutes talking about anything BUT CrossFit, and really not talking at all, just asking questions and getting out of the way. It has worked wonders and has even bled into my conversational style in general- I find myself asking a lot more questions and enjoying the act of actively listening with my friends and family way more than I used to. Practice makes… passable? One thing I’ve kept reminding myself is that this process doesn’t end. Just because the cracks are fixed right now doesn’t mean they won’t pop up again. I’ve got to constantly assess and reassess our systems and the way things run to make sure that going from Point A (“I should try CrossFit!”) to Point B (“I’m a proud member of CrossFit Lumos!”) is as seamless and intuitive as possible. As the gym grows and changes I will need to adapt and change with it, and that’s part of the fun, even when it’s challenging.